Double-click in your image, and then right-click over the Y-axis (the label "Y-axis" should be visible). Select "Axis format" from the contextual menu. Go to the "Numbers" tab and de-select (un-check) the option "Format of origin". Now you can adjust the value of "Decimals" (e.g. to "2") under the "Options" section. Click "OK". Click to open a full-resolution version of the image. Now, as to why the Y axis shows this (very small) number when it should be simply zero, I don't know. 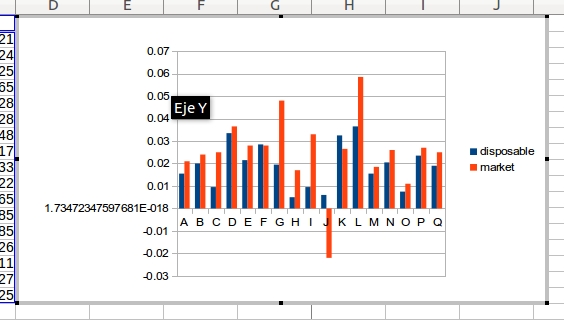 The axis properties are automatically set so the X-axis should be placed at zero, but the graph somehow shows something else. This is surely a bug, now it is a matter of finding out whether it has been reported already. If not, please file a bug. Either way, please post a link to any bugs found or filed in a comment below using the format "fdo#123456". The problem seems very similar to bug fdo#55960. While the bug description deals with Fill Series in cells I would be unsurprised if the two problems are related. Can you please provide a link to the file? 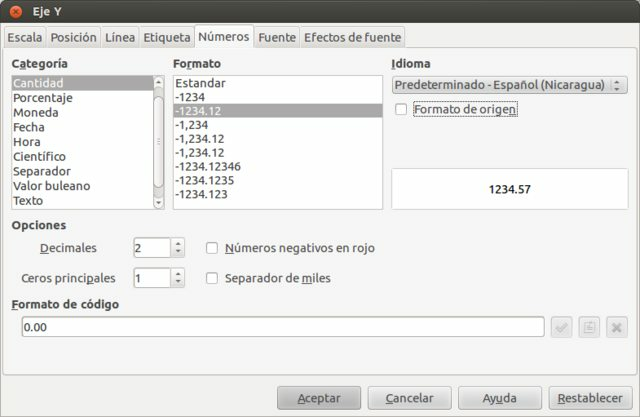 Which LibreOffice version are you using? Under which OS? I've added version and OS. I can't upload files because my karma is too low.